The cast of Single Wide. Photo by Roberto Araujo. BOTTOM LINE: A charming new country musical with great lyrics, fun music, and strong, likeable characters. 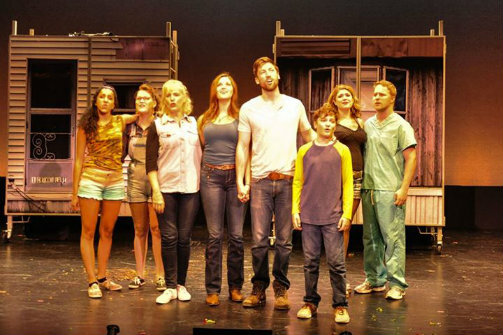 When a new musical is set in a trailer park, I start to worry. Is the setting supposed to provide cheap humor at the expense of low-income, under-educated people? The creators of Single Wide, book by George D. Nelson, music and lyrics by Jordan Kamalu, have put my fears to rest. The appeal of this new musical is not derived at the expense of the characters, but in celebration of them. These are good people with big hearts who love each other an awful lot, and we can’t help but love them too. Even the ones who are up to no good. Katy (Emma Stratton) is a strong, single mother raising her 11 year-old son, Sam (Matt Miner) in a trailer home, along with the help of her mother (Stacia Fernandez). Katy works overtime while taking online classes in the hopes of someday pursuing a “real job.” She is hardly the weepy-eyed down-trodden type searching for a prince to rescue her, but a self-sufficient woman who is convinced that the only man that belongs in her life is her son. One of the most touching and cleverly written songs in the show is a duet sung by mother and son, called “One for Me,” and Stratton’s and Miner’s beautiful voices blend exquisitely to hit this number out of the trailer park. When a reclusive and mysterious Guy (that’s his name as well as his gender, played with tremendous likeability by Derek Carly), becomes their next door neighbor, the entire neighborhood falls in love with him, including the fatherless Sam. Guy seeks refuge in his new home as he struggles with a whirlwind of emotional turmoil having just completed three tours in Afghanistan. But despite his tendency to lose his temper, he’s a good man and undeniably right for Katy. If only she can find the courage to let another man in her life before her shameless and aggressive best friend, Flossie (Jacqueline Petroccia), gets her paws on him. This new musical offers several toe-tapping numbers that stay with you. The witty lyrics and the country music are fun and appropriate. Director Jeff Whiting keeps the action moving fluidly, and all of the performances are excellent, including and perhaps especially, the kid Miner, who plays his part with great charm, and without constantly calling attention to that fact that he’s a cute kid. Though the story is delightful and the characters face stage-worthy challenges, the drama stops just shy of creating a moving experience. The characters are never challenged beyond their limits, and therefore, never face losing much of anything at all. Their situation never grows dire enough to demand empathy. While there is something quite lovely about the optimism and happiness in this show, Nelson and Kamalu could allow their characters to get dragged through deeper mud. While the story still needs strengthening, it has great potential. The regional theatre world would do very well to embrace this modest and affordable new musical and develop it further. And I will be very anxious to see this writing team’s next offering. It would not surprise me to see their names on a Broadway marquee in the not too distant future.